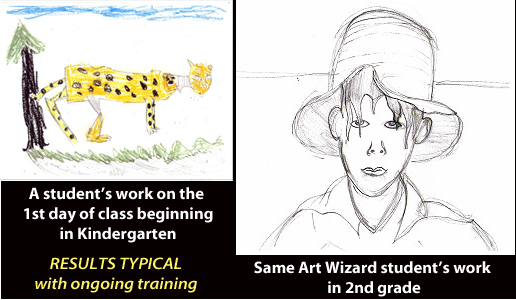 Art Wizards is a fine art drawing program for elementary age students. We teach after school and summer drawing classes, and also offer drawing classes for special events. You’ll find us in Seattle, Tacoma, Auburn, Everett, Edmonds, Redmond, Kirkland, Snohomish, Kent, Puyallup, and many other communities around Puget Sound. Every child can learn to draw and paint beautifully. We teach them how. Our classes were created for children in grades 1 to 6, they but have bee n enjoyed by many older students and parents as well. Our curriculum was developed by Ilene Adler, Ph.D., an educational psychologist who is also a professional artist and sculptor. With her wide range of experience, she was able to see clearly what children need to understand in order to draw and paint realistically, and to enjoy the learning process. When a child first looks at a scene, object or photo, the first impression will be color, texture or some other overall impression. The thought of drawing it can be overwhelming because they have no idea at all where to start. Without a plan and some basic understanding, they will likely give up in frustration. But start them off right, and they’ll gain all the academic benefits that drawing offers. And, they’ll have a lifetime of enjoyment. Art Wizard lesson themes include birds and animals of all kinds, people and landscapes, mythical creatures and favorite movie and cartoon characters. We teach our students the best ways to use chalk and oil pastel, watercolor, colored pencils and markers. We also teach them what and how to practice so their progress continues. Just look at the wonderful artwork in our galleries! To enroll your child in one of our classes, for information on bringing Art Wizards classes to your school, or to host a drawing class event, give us a call or send an email. Please see our contact page for our phone number or use the email form to contact us.